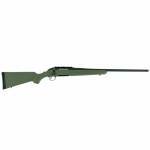 Features a shorter length of pull (for smaller shooters or those wearing heavier outerwear) and a shorter barrel, for a reduction in overall length of more than five inches. 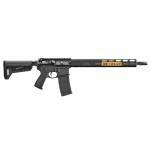 Ergonomic, lightweight synthetic stock designed for quick, easy handling blends a classic look with modern forend contouring and grip serrations. Ruger Marksman Adjustable trigger offers a crisp release with a pull weight that is user adjustable between 3 and 5 pounds, allowing shooters to make that perfect shot. 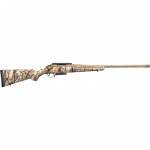 The one-pie..
Ruger's American Rifle offers minute-of-angle accuracy that can make every hunt a success. The one-piece, three-lug bolt with 70 degree throw provides ample scope clearance and utilizes a full diameter bolt body and dual cocking cams for smooth, easy cycling. Its patent-pending Power Bedding, integral bedding block system positively locates the receiver and free-floats the barrel for outstanding accuracy. 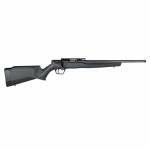 The ergonomic, lightweight synthetic stock with soft rubber buttpad is designed for quick, ..
Ruger's American Rimfire rifle features a patent-pending Power Bedding integral bedding block system which positively locates the receiver and free-floats the barrel for outstanding accuracy. The cold hammer-forged barrel results in ultra-precise rifling which provides exceptional accuracy, longevity and easy cleaning. 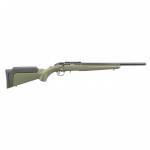 The American Rimfire rifle also has a Ruger Marksman Adjustable trigger, tang safety, easy-to-use 10/22-style extended magazine release, and a 3/8" rimfire scope base that is mach..
Ruger's Mark IV features a simple, one-button takedown for quick and easy field-stripping and proper chamber to muzzle cleaning. The recessed button in the back of the frame allows the upper receiver to tilt up and off of the grip frame without the use of tools. Its internal cylindrical bolt construction ensures permanent sight to barrel alignment, while the contoured ejection port and easy-to-grasp bolt ears allow for durable and reliable operation. The accurate sighting system features a drill..
SMITH & WESSON INC Shield S&W 180021 M&P Shield 9mm 3.1" 7+1, 8+1 Syn Grip Black Finish Incorporates the design features of the highly successful M&P line of firearms. Extremely thin and lightweight design means that it can be comfortably carried all day. Single sided thumb safety and slide stop maximize slimness. M&P's patented take down lever and sear deactivation system allows for disassembly without pulling the trigger. 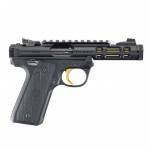 Chambered in 9mm and .40 S&W for proven sto.. Built for personal protection and every-day carry, the M&P380 Shield EZ is chambered in 380 Auto and is designed to be easy to use, featuring an easy-to-rack slide , easy-to-load magazine, and easy-to-clean design. Built for personal and home protection, the innovative M&P380 Shield EZ pistol is the latest addition to the M&P M2.0 family and provides an easy-to-use protection option for both first-time shooters and experienced handgunners alike. • Easy to rack slide. • Crisp, light trigger w.. The biggest bulls. The longest shots. With the new Savage 110 High Country, they’re all within your reach. 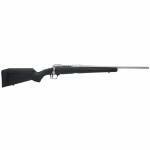 The rifle is built to maximize accuracy with a spiral-fluted barrel and bolt, as well as the Model 110 action secured three-dimensionally along its entire length within the AccuStock internal chassis. The AccuFit system lets hunters customize length-of-pull and comb height of the TrueTimber Strata synthetic stock. Plus, the user-adjustable AccuTrigger offers a crisp, clean pull critical for.. 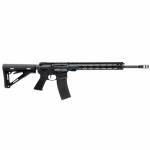 The Savage B22 Magnum FSR rifle is suppressor ready and features a black synthetic stock, 16.25" black carbon steel barrel with adjustable sights, a detachable rotary magazine, and an AccuTrigger that gives a shooter the flexibility to set the trigger pull to their individual preferences. 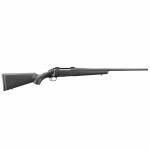 Action: Bolt Caliber: 22 Winchester Magnum Rimfire (WMR) Barrel Length: 21" Capacity: 10+1 Trigger: Accutrigger OAL: 39" Weight: 6 lbs Stock Description: Synthetic Black Metal..
AccuFit System, Flat Dark Earth Stock, Threaded Heavy Barrel with End Cap, 20 MOA EGW Rail, Soft Grip Fore-end and Pistol Grip Surfaces, Tactical Oversized Bolt handle. 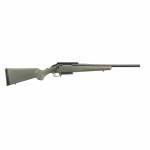 Caliber: 6.5 Creedmoor Series: 110 Series Magazine: Detachable box Stock Material: Synthetic Barrel Material: Carbon Steel Barrel Finish: Matte Barrel Color: Black AccuTrigger: Yes AccuStock: Yes Twist: 1:8" Weight: 8.87lbs Overall Length: 45.5-46.5" Barrel Length: 24" Ammo Capac..
After one of the most rigorous and highly competitive review processes in the history of military firearms, the SIG SAUER M17 was awarded the Modular Handgun System (MHS) contract for the U.S. Army. The M17 is a P320-based platform, and was selected for its uniquely innovative modularity, uncompromising performance, and unmatched capability. The P320-M17 closely follows the specifications of the U.S. Army’s M17. 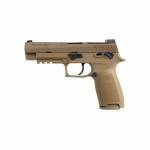 “It was truly an honor for SIG SAUER to be chosen as the U.S. Army’s choice with .. 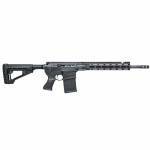 The MCX Rattler Canebrake is the newest addition to the MCX family. It was created for those that desire the MCX as a suppressed system, and eliminates the need to purchase additional components to do so. It comes with a factory installed inert training device, making it operable right out of the box while NFA paperwork and waiting periods are completed, and then is easily convertible to run suppressed. 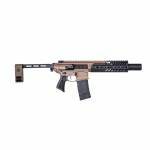 The MCX Rattler Canebrake comes as a suppressor ready platform with an SD handguard and inert.. The P229 was the first pistol to be manufactured in Exeter, New Hampshire. Available in 9mm, the P229 Select features a Nitron stainless steel slide, SIGLITE Night Sights and custom G10 grips. 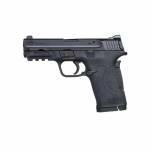 It's compact size and low-profile controls also makes it ideal for concealed carry. Action :Semi-Auto Caliber :9mm Barrel Length :3.9" Capacity :15+1 Grips :Custom G10 Sights :Siglite Night Weight :34.4 oz Frame Finish :Nitron Frame Material :Alloy Slide Description :Nitron Stainles.. The P238 Extreme is just a fraction of the size of the full-size pistols. 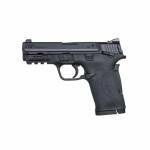 Built with the same accuracy and reliability as large frame Sig Sauer pistols. 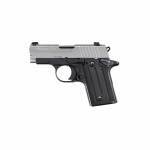 The Sig Sauer P238 is the ultimate firepower in an all metal frame concealed pistol. The P238 is built on an alloy beavertail style frame. 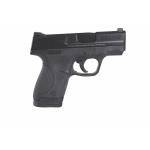 Action :Single Caliber :380 Automatic Colt Pistol (ACP) Barrel Length :2.7" Capacity :6+1 Safety :Thumb Grips : Black Sights :Contrast Weight :15.2 oz Frame Finish :Black Hard Coat Anod..